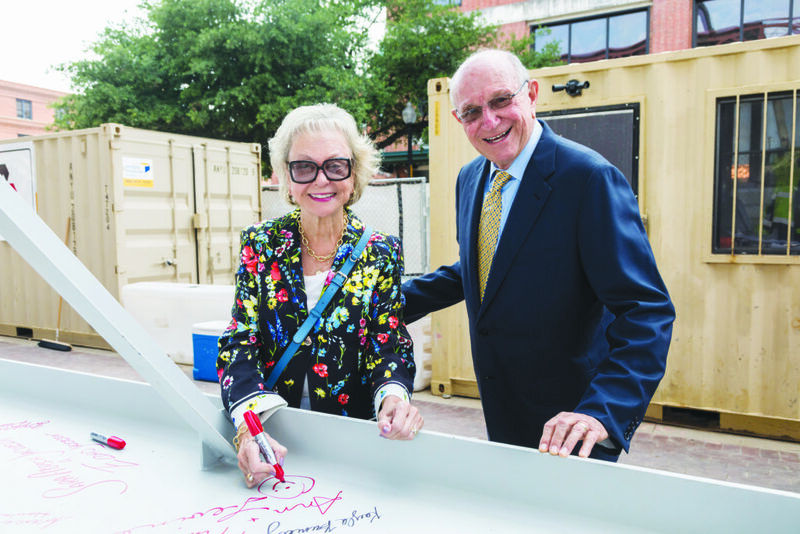 Local survivors of the Holocaust and other genocides were recognized June 13 at a special “topping out” celebration as construction of the new Dallas Holocaust and Human Rights Museum enters its final phase. Ron Steinhart, campaign co-chair; Brad Brown, president of Austin Commercial; Thear Suzuki, board member; The Honorable Florence Shapiro, Holocaust Museum board chair and daughter of Holocaust survivors; and Mary Pat Higgins each addressed the gathering. A time capsule which included letters from survivors will be placed inside the walls of the new Museum. Finally, the crowd shouted “Fly the Beam” in unison and watched skyward as construction workers secured it to the three-story structure. Construction on the new museum commenced on Oct. 10, 2017 and is set to be completed in September 2019. Upon completion of the new 51,000-square-foot museum, Dallas will move to the forefront of 21st-century human rights education with all new interactive exhibitions, state-of-the-art theater and gathering spaces, accessible archives for documents and historical artifacts, and classrooms to accommodate school groups. The new museum will be unique among the nation’s 21 Holocaust-related museums, featuring an expanded examination of the Holocaust with dozens of video testimonies from Dallas-area survivors, along with new, in-depth technology-enriched exhibits on other genocides, human rights issues and American ideals.